I love giving gifts.. Who doesn’t? I really love handing over a beautifully wrapped present and waiting for the recipients expression. You don’t have to spend a fortune on wrapping paper and cards. 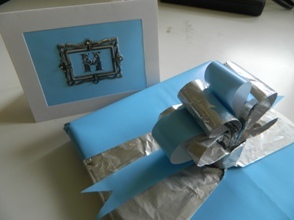 Here I wrapped a book with plain blue paper and aluminium foil. Aluminium foil is great because we always have some and it is great to work with. It can be rolled, folded and shaped to how you want. The card is a white piece of cardboard with a window cut out of the front. I then placed a piece of the blue wrapping paper behind and secured with double sided tape. I then used some stickers that I get from the discount shops to decorate the front. Initials are nice to use as they alert the recipient to the fact that the card was made especially for them. Do you love wrapping presents or is it just me? Reaks of a famous Marylou project.